This leg of the initiative is set to be a National Coaching Course to be held from the 28th January to the 2nd February 2019 in the capital, Bandar Seri Begawan. 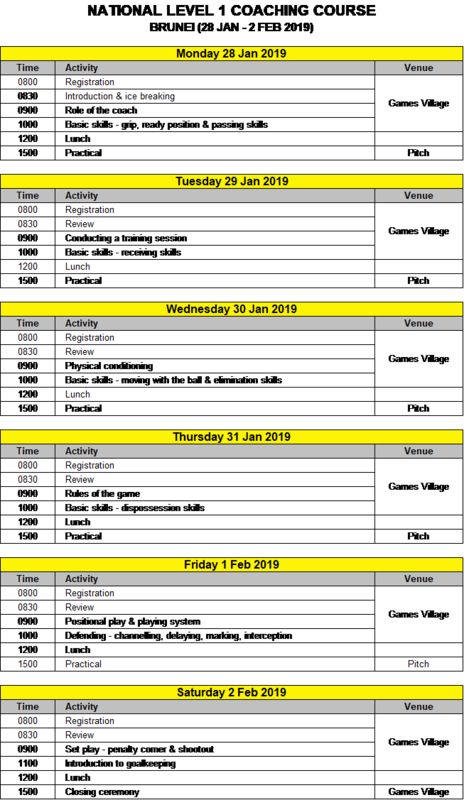 Bandar Seri Begawan, Brunei: This leg of the initiative is set to be a National Coaching Course to be held from the 28th January to the 2nd February 2019 in the capital, Bandar Seri Begawan. Lim Chiow Chuan is all set to be appointed the official course conductor for this coveted event. Mr. Chuan, a former Olympian, is a very familiar and respected name within the hockey fraternity. After having served Malaysia extensively in his capacity as a player, he has made a great name for himself as a course conductor and is a prized asset of the Asian Hockey Federation. Lim is also an FIH High-Performance Coach as well as a FIHA Coach Educator & Trainer. With tons of experience under his belt, the participants in Brunei are to benefit greatly from what he has to offer. Brunei, known for its bio-diverse rainforests and hospitable people, is all set to host the 5-day event in all its glory. There is a great degree of expectation attached to the number of participants, starting the 28th of January. The Raja Ashman Shah Hockey Academy has truly served its purpose to bud and prosper hockey within all corners of Asia, and a National Coaching Course in Brunei seems a natural progression to it. Such coaching courses allow the FIH and AHF the opportunity to imbibe within fresh candidates the wisdom and expertise required at the highest level, from veterans such as Mr. Lim Chiow Chuan. They also add to the quality of the sport of hockey; a high performance umpiring staff is critical for the evolution of the sport of Hockey.